Join the conversation on Instagram and Twitter by tagging your photos and posts with #ATS2016. Follow these simple tips to make the most of all your updates. Change your perspective to better frame your photo. Switch to portrait orientation for vertical photos. Focus on your subject with the tap of your screen. Mix things up with off-center photos. Enable public setting on your Instagram app. Tag your images with #ATS2016. Who: Include your chapter, committee, assembly, or section in photos of yourself, mentors, and others. When: Avoid the midday sun when natural light is the most harsh. Opt for early morning, late afternoon, and early evening photo opps. Why: Photos are fun to share, and your colleagues will feel engaged. yourself to about two per tweet. Include the official conference hashtag, #ATS2016, so attendees can see, share, and engage with your tweets. Less is more: Stop short of the 140-character limit to allow for easy sharing and reposting (e.g., RT @atscommunity). Diversity is key: Follow the 60-30-10 rule with 60 percent re-tweets to promote other posts, 30 percent for conversation and responses, and 10 percent for your updates, announcements, and events. Remember: You are joining the conversation, not taking it over. Active members of ATS chapters, committees, assemblies, or sections can use this primer to build their social media presence. Have a heartbeat: Don’t overwhelm your followers. A basic guideline for social media frequency is about one Facebook post per day, or five to seven posts per week. For Twitter, a general rule is three to five tweets per day. Feed your soul: Inspiration for posts takes time and effort. Get into the habit of regularly searching, sourcing, and posting compelling content. Speak with images. Photos uploaded to Facebook generate five times the interaction and engagement compared to posts without photos. Twitter is the same, with tweeted photos getting twice the interaction. Stay fit: Social networks are mobile, so view your posts on mobile devices to make sure they appear correctly. Use link shorteners, such as bit.ly, to add more information and keywords to your updates. Test content variations. Do certain pictures perform better than others? Is there an optimal time of day, or day of the week to post? 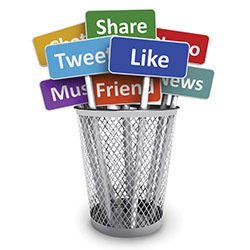 As you adjust what you post and how often, you’ll soon go from social media novice to pro.